Audi Certified, ONLY 24,383 Miles! FUEL EFFICIENT 30 MPG Hwy/21 MPG City!, $1,500 below NADA Retail! Sunroof, Heated Leather Seats, All Wheel Drive, Rear Air, Turbo, HEATED FRONT SEATS, ASH BROWN NATURAL WOOD INLAYS READ MORE! Leather Seats, Rear Air, Turbocharged Audi Premium with Monsoon Gray metallic exterior and Chestnut Brown interior features a 4 Cylinder Engine with 220 HP at 4450 RPM*. HEATED FRONT SEATS, ASH BROWN NATURAL WOOD INLAYS. MP3 Player, Sunroof, All Wheel Drive, Aluminum Wheels, Keyless Entry, Steering Wheel Controls, Heated Mirrors. 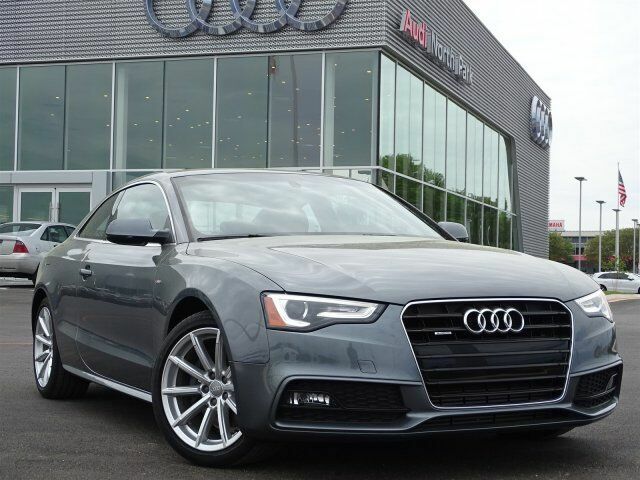 This A5 Coupe is priced $1,500 below NADA Retail.